That makes people drive crazy in So Cal. It also makes some of us act crazy. Remember this pic? This is how I feel about the rain too, but instead of getting naked I prefer to snuggle up indoors with a nice cuppa somethin’ warm. The perfect day to be working from home where no one in the world knows that I’m still in my yoga clothes. Except for maybe now you. But you won’t judge me for it, and I’m my own boss, so rain on grey clouds, I’ve got the best seat in the house. My new desktop image for the day. 🙂 Love this boy. 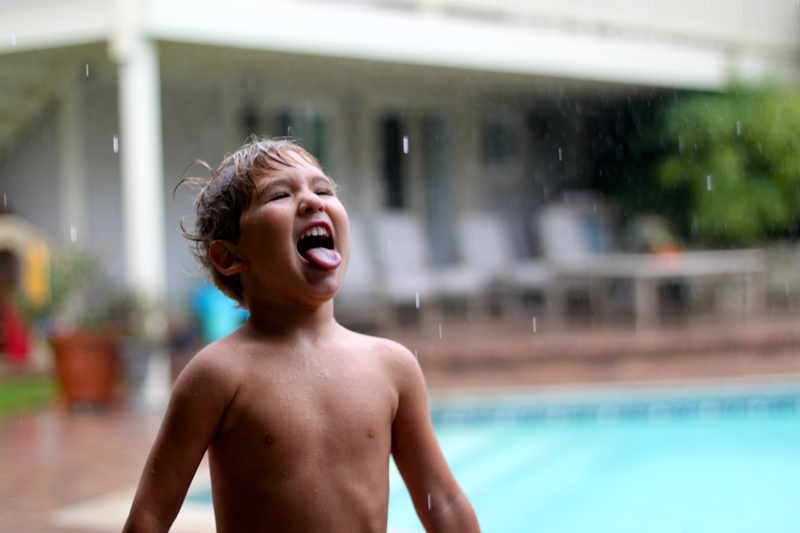 Mason and Keaton understand rain because they understand joy, like you and Kev… that’s why they like to play in it. Rain is life in action and children inherently know how to celebrate life… in any way they can. So they laugh, sing, and dance… without hesitation (unlike most grown-ups)…in the rain.